Round 23 – Richmond v Western Bulldogs: Big week in Canberra, big day at the MCG. You don’t have to live in Canberra to know it had been a big week in politics. I do live in Canberra, and I was scared to leave my house in case someone of political persuasion, but without arithmetic skills, tried to rope me in to becoming the next PM. Having gone through uni courtesy of a Gough Whitlam scholarship there was a minuscule chance I would have acquiesced anyway. It was fitting, and coincidental, that this week I started reading George Megalogenis’s new book, The Football Solution: How Richmond’s Premiership Can Save Australia*. In the opening page, George wrote, “Richmond was the tragic character in a soap opera, destined for perpetual heartbreak”. Indeed that line could be applied to both clubs in today’s game. Both clubs have had their recent tragic-comedy performances played out on the public stage while also being the premiers of the past two years. Onto the game. 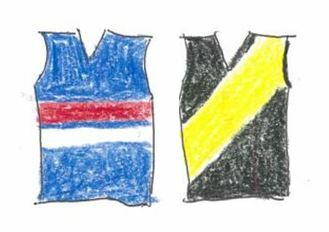 In a peculiar twist of the AFL fixture, which I don’t understand, today’s game was the first time Richmond and the Western Bulldogs (still Footscray to me) have met this season. The last game between the two clubs was Round 7, 2017 which the Doggies won by five points. Even to this faithful Richmond supporter back then I didn’t think, or probably even contemplate, Richmond would win the Grand Final. A 2.10 pm game on a Saturday afternoon harks back to the old days of footy. While in some ways today’s game was inconsequential to the final ladder positions – Richmond will finish top regardless and in all likelihood the Doggies will remain in their current position of thirteenth – it is still a game of footy to be won. Whether it is the ghosts of the past that George Megalogenis alludes to, or simply because it’s a game of footy, I still get nervous when Richmond takes to the field. From selections, all indications were Richmond were treating this match as a full match rehearsal for the finals. Cotchin, Astbury and Prestia were brought back in. I feel for the Doggies as while they had their best side available, this year they have been cursed by injury. Regardless, you can only play who is on the field so it is 18 v 18. However in the mire of unknowns, will the Doggies play with freedom and Richmond without intent, more concerned about getting through the game. The game started as if footy was an free and open game, and would have made those at AFL headquarters put their rule change pencils back in their case. The Doggies kicked six straight and Richmond kicked 5.1. The Doggies’ Brad Lynch kicked the first two goals of his career in the quarter. Richmond’s Jack Graham kicked three straight though with the Coleman Medal still up for grabs, Richmond might have preferred the Jack was Riewoldt if they were going to indulge in any selfishness. The only nod to defensive footy in the quarter was when Rance marked during the term Richmond broke the VFL/AFL record for the most intercept marks in a season. In the second quarter the Doggies continued to play clever footy. They tried to kick the ball low into the forward line thereby limiting the damage Rance and Astbury could do in the air. In addition, they tended to bring the ball through the centre in a bid to thwart Richmond’s intense pressure. Importantly it seemed to be working. Jack Macrae was in danger of leather poisoning having 23 disposals so far for the game. At halftime the Doggies lead 8.3 51 to Richmond’s 7.7 49. The third quarter was scrappy and might have had the AFL rules committee getting their pencils out again. While Dustin Martin had 13 possessions for the quarter he seemed to be out of sorts at times. Maybe he was subconsciously trying to protect himself for the finals. Dusty did assist in a milestone when he passed to Riewoldt who then converted for his 600th goal in AFL footy. It also put Riewoldt five ahead in the live Coleman Medal race. The Doggies Ed Richards kicked a superb fifty metre worm burner to goal which is probably unusual in modern footy and, in fact, in any footy. Billy Gowers also kicked a goal and I was a little disappointed he didn’t have his sleeves neatly rolled up to his elbows like his dad. However, that’s hard to do when you wear a sleeveless jumper. At the end of the quarter Richmond lead 12.8 80 to 11.6 72. In perhaps a portent for the finals, in the last quarter Richmond were able to shut down the Doggies attacking through the centre. However, given the the Doggies outscored Richmond in the last quarter they were able to find another way to goals. Richmond, though, were able to employ their little know 19th player, the goal post. Unluckily for the Doggies they hit the post three times during the quarter. The last one by Lynch with less than 30 seconds on the clock would have won the game for the Doggies if it had gone through. Alas it didn’t. In the end, Richmond scraped through by three points for their 21st straight win at the MCG. What to take from the game? The Doggies can play very good footy. The Doggies had a game plan which could potentially beat Richmond. Conversely, Richmond were able to adapt to the Doggies game plan which could be to Richmond’s overall benefit especially for the finals. Richmond, subconsciously, may not have played with full intensity, but still were able to win. The events in Canberra this week made these wise words even more insightful. Looked at in isolation, this was daylight robbery by the Tigers. There was clearly one side out there that played with full intensity and they weren’t wearing yellow and black. Of course we can’t look at the game in isolation. This was very much a game to get through for Richmond, with the main upside being a clean bill of health. On that count alone, we can describe it as a win. I will read George’s book with interest. In times like this we need every reminder we can get about the qualities that make strong, functional institutions. They apply just as much in the frivolous world of sport as to the serious business of government.